In the Portland, Oregon metropolitan area, the Animal Shelter Alliance of Portland (ASAP) reduced euthanasia in local shelters by a dramatic 65% from 2006 to 2012. Nine out of ten dogs and seven out of ten cats now leave the shelters alive. No healthy animal has been euthanized since 2010. Our current Live Release Rate is 85%. We accomplished this progress through a unique coalition of every major shelter in the region, working in partnership for our common goals. ASAP was founded in 2006 when leaders of the largest private animal shelters, public animal service agencies, spay/neuter organizations and professional veterinary associations committed to working together to address pet overpopulation, reduce shelter intake and end unnecessary euthanasia. Today, ASAP is a working coalition of ten founding partners that serves the greater Portland, Oregon/Vancouver, Washington metropolitan areas. Our mission: "End the euthanasia of healthy, social, and treatable dogs and cats in our local shelters by collaborating on spay/neuter programs, committing to educational and outreach efforts and promoting humane alternatives for feral cats." In 2004 - 2005, several shelters and rescue groups in the Portland area came together for a series of unstructured meetings to explore the possibility of pooling our efforts and resources. The first few meetings at times were divisive, unproductive and somewhat chaotic. Unfortunately at the time, people were distrustful of one another and defaulted to focusing on their own viewpoints and priorities. In 2006, several leaders of the larger shelters made another attempt at forming a coalition. This early collaboration included all the county shelters and all the nonprofit shelters that took in more than 1,000 dogs and cats annually. Collectively, these organizations covered all stray animals and the vast majority of owner-released animals in the metropolitan area. During these early meetings, one of our primary objectives was to establish a culture of respect, accountability and trust among the organizations. We agreed to mutual expectations and commitments. And by placing the greater good of the coalition above politics and bureaucracy, we acknowledged each other's differences in policies and procedures. Once the coalition was established, we reached out to involve other smaller organizations in our programs to maximize our lifesaving efforts. In 2007, we held several strategic sessions where we developed a three-tiered approach to saving lives by identifying key short- and long-term projects. Some agreements were easy to implement immediately, while others had to be carefully analyzed and planned. Decrease shelter intake: spay/neuter initiative, TNR, return to owner (pet identification, licensing), lost & found system, behavior resources. Management of dogs and cats while in the shelter: transfer system, standardized shelter care guidelines and medical protocols, resource sharing, foster care, behavior training. Increase shelter adoptions: adoption events, media/PR/marketing. One of the pillars of our success is honest, consistent and shared statistics among all the partners. The coalition has made it a priority to collect and review our shelter statistics on a regular basis. This enables us to identify the greatest opportunities to save the largest number of animals and strategically plan our work and then work the plan. With generous support from Maddie's Fund® in 2008, ASAP began collecting and reporting shelter data according to the Asilomar Accords. We also established a Pet Evaluation Matrix (PEM) with input from the animal welfare community, the veterinary community and the general public. The collecting and reporting of data proved to be quite difficult and time-consuming. But the process brought our organizations closer together and inspired us to learn to speak the same language. Our joint efforts to train all levels of staff have helped acquaint key people in the agencies with one another and further strengthened our commitment to saving lives. Our diligence helped us track the progress and success of the individual shelters side-by-side. And importantly, the data provided us with a more complete picture of the safety net our community provides for animals and the adoption guarantee status it has helped us achieve. 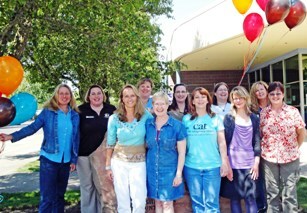 The ASAP leadership committee includes the Executive Directors of all partner organizations. We meet on a monthly basis to review our priorities and discuss challenges and opportunities. In order to inspire ownership of ASAP's mission and programs at all levels, we also formed the Lifesaving Committee, consisting of the operations managers from the various shelters. The committee ensures that member shelters effectively and efficiently assist each other. For example, a system was implemented to monitor shelter capacity and issue an email alert to all operations managers when a healthy animal is in danger of being euthanized. Treatable and unhealthy & untreatable pets are also transferred as resources allow. 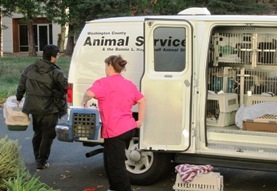 In the past six years, between 1,500 and 2,000 cats and dogs have been transferred each year between ASAP shelters. Dogs and cats in our shelters across the Portland community are now considered "ASAP Animals" and are the responsibility of the coalition as a whole, not just the individual shelters. To ensure that ASAP shelters are consistent in how they evaluate and assess the condition of dogs and cats, the Lifesaving Committee trains frontline shelter staff to accurately utilize the Asilomar Guidelines and the Pet Evaluation Matrix. Common medical protocols established by ASAP provide for consistency in animal care. Partner agencies contribute equitably, rather than equally, for the sake of our community's animals. ASAP Shelters collaborate on staff training, software and sharing of behavior and medical resources whenever possible. For example, on-call doctors at the Oregon Humane Society address urgent questions during weekends when other partner shelters might not have medical staff available. Shelters also share pet food, crates, medical supplies and personnel. Working together in partnership has inspired the organizations to push themselves harder. This has resulted in improvements in individual shelter operations and new strategies to save more lives. The individual efforts include improved shelter appearance, adding veterinarians to the staff, social media and adoption outreach, enrichment programs for shelter pets, improved customer service, a commitment to treating each animal as an individual and expanded foster care. Review of our data showed that about 80% of animals euthanized in our area shelters were cats. So, we placed them at the top of our priority list. A targeted spay/neuter program in two high-intake zip codes was tested. Given its success, we implemented a community-wide program for low-income families. Since February 2010, the program has completed more than 27,000 targeted surgeries by leveraging the quality of medical facilities at five of ASAP's partner organizations. So far, cat intake has declined by 25% from 2010 to 2012. Our cat Live Release Rate has increased from 49% in 2006 to 78% in 2012. ASAP is now concluding a one-year pilot program utilizing Geographic Information System (GIS) mapping to identify specific census tracks and neighborhoods with the highest rates of shelter intake for cats and Pit Bulls. With the aim of dramatically reducing shelter intake, we are currently testing incentives to support responsible pet ownership and keep pets in homes. The initial results are encouraging - cat intake in the targeted area is down about 27% and Pit Bull intake is down by about 60%. Building on our successes and proven impact of our current projects. Developing new strategies to address the special needs of our treatable cats and dogs, such as a regional foster network. Focusing on coalition-wide adoption events, especially to get our harder-to-adopt pets into homes. We've learned that a community can truly be transformed by the relief and pride of not euthanizing any healthy dogs or cats. Our coalition has arrived at a place where the commitment to saving every life in our region's shelters is a given. Because we achieved our transformation organically - through collaboration and inclusiveness - the principles of ASAP are fully integrated into our culture and are permanently embraced not only as a "best practice," but as the only responsible practice. By planning and executing our strategies in concert, ASAP has achieved successes as a collective group that we could not have dreamed of as a disparate group of organizations. That's the synergy of a true coalition. We appreciate the opportunity to share our story. More information can be found on ASAP's website. We also welcome the opportunity to talk to anyone directly. Britta Bavaresco is a co-founder of the Animal Shelter Alliance of Portland and contributes to ASAP in a leadership role, working on strategy, marketing and fundraising. Britta has directed business-building strategies for both corporate and non-profit companies. In the corporate world, Britta developed marketing and advertising strategies for international iconic brands (e.g., Levi Strauss & Co.) and smaller, entrepreneurial brands (e.g., Peet's Coffee & Tea and Odwalla). Twelve years ago, her passion for animal welfare led her to leave the corporate world and join the non-profit community. During that time, she spent six years as Executive Director of the Cat adoption Team (CAT), leading the organization to become the largest feline-only shelter on the West Coast with over 3,200 adoptions a year.